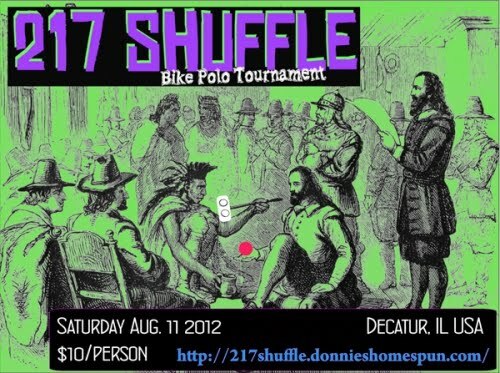 TOP SHELF POLO: Off to Decatur for the 217 Shuffle! Off to Decatur for the 217 Shuffle! Never played a shuffle tournament before so i'm pretty excited about this! Plus dougie fresh has been trying to get me over there for what seems like years now. Excited to check out their permanent court, drink some whiskey, and see all my COMO friends! See y'all there! Mankato Joe gets a Joust! Call Me Daddy wins the 2012 World Championship! World Championship - LIVE RIGHT NOW! Arena bike polo webstore is looking good!